The Smoothwall enables you to deploy Intrusion Prevention policies to stop intrusions such as known and zero-day attacks, undesired access and denial of service. 1. Go to the Services > Intrusion system > IPS page. • IPS Policy — From the drop-down list, select the policy you want to deploy. See About the Default Intrusion Policies on page 287 for more information about the policies available. You can select from the default policies provided with the Smoothwall, or customize a policy to suit your network, see Creating Custom Intrusion Policies on page 290. • Enabled — Select this option to enable the policy. 3. Click Add. 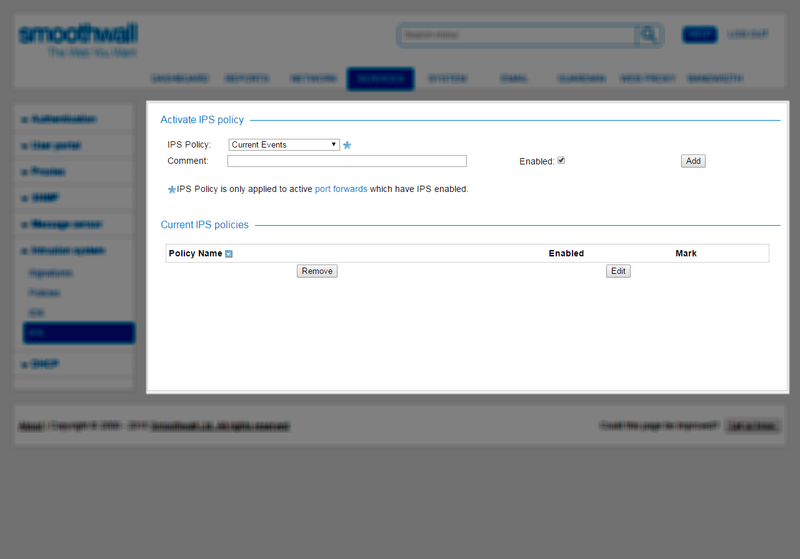 The Smoothwall lists the policy in the Current IPS policies area. 2. In the Current IPS policies area, select the policy you want to remove. 3. Click Remove. The Smoothwall removes the policy.